Fianna Fáil will tonight ask the government to stall the procurement process and review what has gone wrong in the roll-out of broadband. 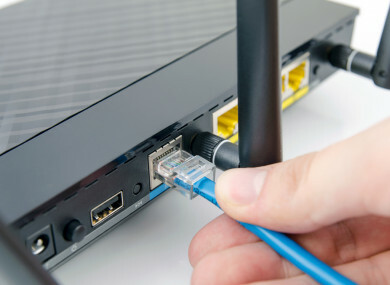 FIANNA FÁIL’S TIMMY Dooley has said the State stepping in to provide broadband to the rural homes that are still not connect should be considered. In a private members motion in the Dáil tonight, the Fianna Fáil communications spokesman will ask the government to immediately stall the procurement process and review what has gone wrong in the roll-out of broadband. “If it requires the State taking a much greater involvement in the delivery of broadband then so be it, but we need to establish that now rather than waiting 18 to 20 months and then the whole thing collapses,” said Dooley. Last week, Eir announced that they were withdrawing their bid for the Rural Broadband Plan. The company has already rolled out fibre broadband – which is a higher quality, higher speed broadband, to 70% of homes across Ireland – but about 540,000 homes and businesses still remaining to be connected. The National Broadband Plan aims to give 750,000 premises nationwide a minimum download speed of 30Mbps. This also covers Irish businesses that currently have no access to broadband from commercial operators. The government had placed a tender out for the remainder of the process, and two bidders were in the mix – Eir and Enet. Eir, having proceeded with its own rural broadband rollout which took 300,000 premises off the list for the State-subsided National Broadband Plan (NBP), was thought to have been the most likely winner of the tender, but since its withdrawal there is now only one remaining company in the tender process – Enet. Dooley is not demanding that a fully independent, two month review take place. However, Communications Minister Denis Naughten will today ask Cabinet to support a counter-motion rejecting calls for a review. The minister argues that stalling the procurement process now to undertake what he dubs an “unnecessary review” would delay the awarding of a contract by several months. Tánaiste Simon Coveney told the Dáil last week that he envisions the contract will be signed in September. Dooley admitted a review could “of course” bring about potential for delays. “There are always unintended consequences but the reality is we have a crisis now, three of the biggest companies in the State… have raised the red flag,” he said. Naughten said a review could seriously undermine the procurement process by introducing significant uncertainty at a critical time when the procurement process is about to enter the final stage, adding that the NBPF is already subjected to external reviews and audits. Dooley said that the whole process is “absolutely undermined”, adding that when three companies with such a vast amount of experience believe the project is not viable, the government should reassess the situation. He said it is “incumbent” now on other government ministers to listen, even “if Minister [Naughten] doesn’t want to listen” and to carry out a review immediately. While Dooley said he would not like preempt the conclusion of any potential review, he said in the failure of a contract being signed, State interventions should be considered. However, he said this should be a matter that is reviewed in the process his party is proposing. Email “Salvaging the broadband plan: 'State stepping in to provide rural internet should be considered'”. Feedback on “Salvaging the broadband plan: 'State stepping in to provide rural internet should be considered'”.